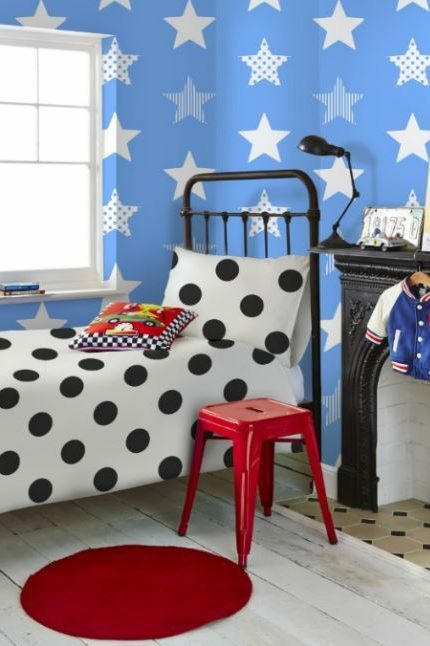 Whether you are renovating a room to turn it into your child’s dream bedroom or transforming an unloved room into a creative playroom, I hope you will find inspiration from my top 10 children’s wallpapers manufactured in the UK by Graham Brown. 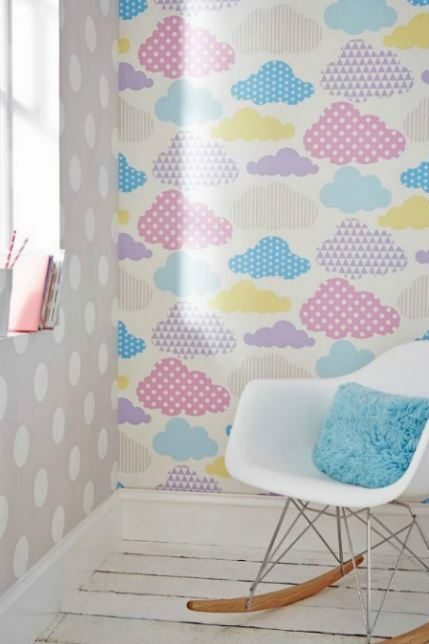 From comics to cuddly toys the range of wallpaper will certainly give you and your amateur interior designers a wealth of wallcoverings to pick from. 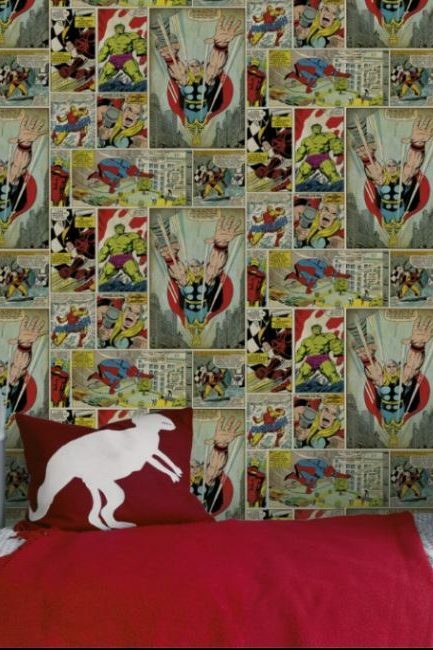 This comic inspired wallpaper brings all the well known super heroes into one room. An ideal feature wall, which can be complemented by blue, yellow or grey accent tones. £10.40 per roll. 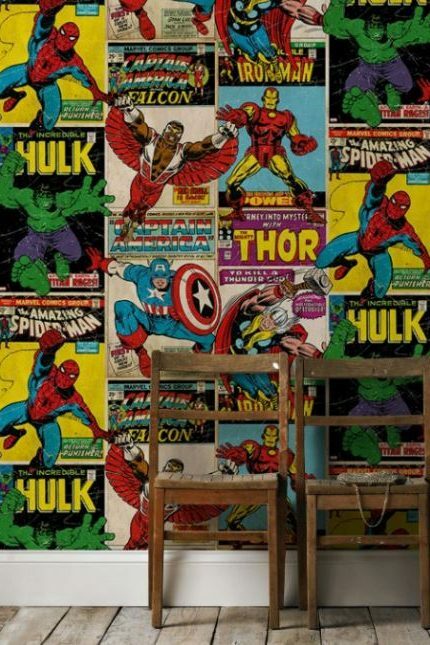 According to Graham Brown the Marvel Comic wallpaper is the best-selling wallpaper in the children’s range, although something tells me a few grown up boys may have this adorning the walls of their study! £10.40 per roll. Which one do you prefer? Over forty years since the original Star Wars film was released and the brand still continues to grow in popularity. I especially like the way this wallpaper has been brought straight up to date with a burst of colour. Star Wars often uses a dark colour palette as its reference, so I love the way the characters are reinvented through the use of a neon colour chart. May the force be with you when hanging this one! £10.40 per roll. 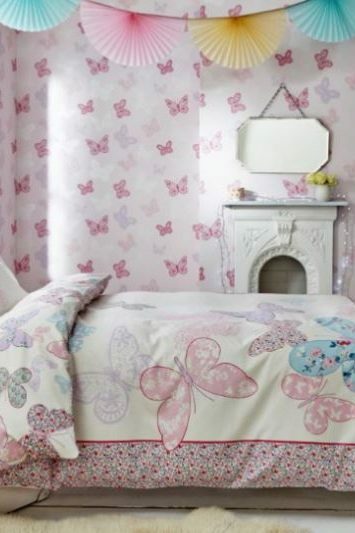 This room can only be described as pretty in pink, the butterflies dance on the wall and the light background gives the room an airy feel which is bright and welcoming. 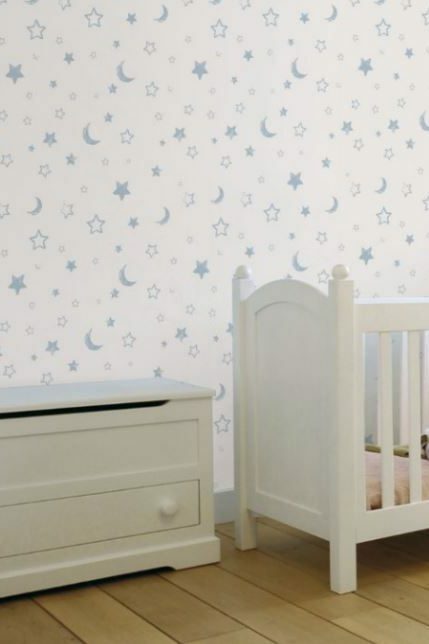 This wallpaper can be perfectly matched with the bed set and pillowcase designed for this wallpaper but can work equally well on its own to give a room a vintage feel, £12 per roll. There is no other word than “adorable”, perfect for your little one who loves their cuddly toys near to them. £12 per roll. 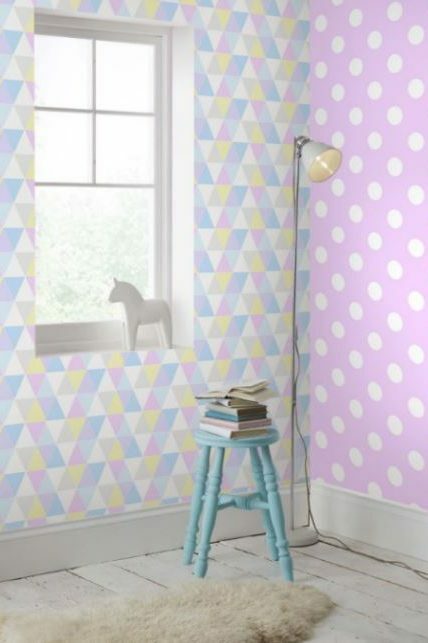 Geometric patterns are definitely on trend, a great way to brighten up a room without introducing any themed characters that may fall out of favour with your off-spring. £12 per roll. 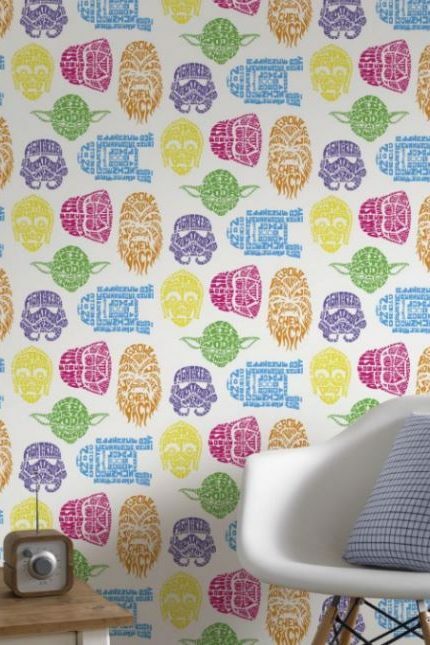 For those children that love cars and tracks then this wallpaper based upon the film is the perfect choice. 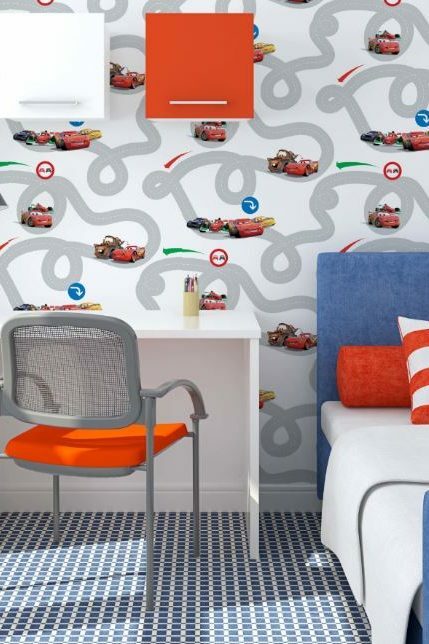 I can just imagine toy cars being made to travel around the track, but it’s ok this wallpaper is washable! £10.40 per roll. 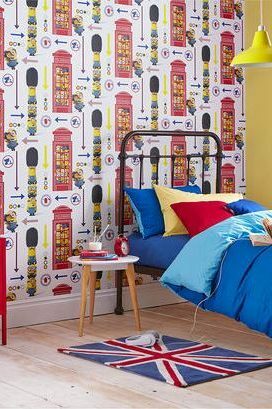 This fun filled wallpaper will brighten a room showing the Minions in all things London. It’s a very busy and British affair to boot and is a must for those Minions fans out there. £10.40 per roll. Next Post What do you do if neighbours object to your planning proposals?